A lot of research takes place in stale environments, like bland boardrooms with bad lighting. And a lot of research asks obvious questions, or worse, questions that participants can’t possibly know the answer to. And researchers often sit back and wait for the thoughtful, truthful sparks of brilliance they need to create insights. At Insights Matter, we start by setting up participants for success, so they can help deliver that great research we’re all hoping for. We engage them in interesting environments. We stimulate discussions with them using purposeful techniques and strategies that include collaboration, analogies or binary oppositions. Jobs Thinking is a way of understanding how consumers use products and services to make themselves better, and to evolve themselves. Jobs Thinking is based in science that has proven that building successful products and customer relationships through simply understanding customer needs doesn’t work. We use Jobs Thinking to look at how to build successful products and successful customer relationships. It's one of the tools in our toolkit! You may be measuring customer satisfaction, but is it really working for you? We can help you refresh how you look at your relationships with customers by helping you understand, measure and improve at the jobs you help them do. 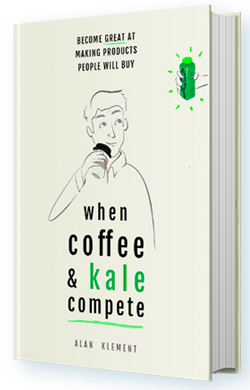 Alan Klement's book When Coffee and Kale Compete.